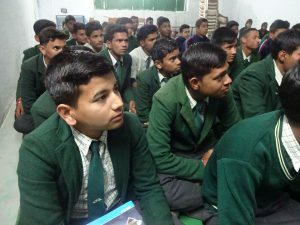 An awareness program was held at Jimp Pioneer School pitamberpur , premnagar Dehradun .The awareness program was attended by the students of class 11th and 12th. 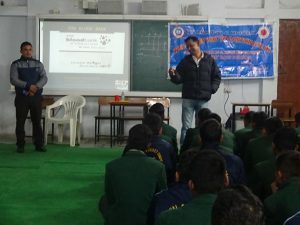 On that program Mr. Deepak (Promoted teacher IMA Blood Bank ) the students were given the awareness on why should one donate blood ,what are the necessary things we have to take care of while donating the blood for e.g the right age for donating blood is 18 to 65 and the minimum weight should be 45 kg and cannot exceed the quantity 350 ml at one time. We can donate blood 2 times in a year and the Hemoglobin level should be 12.5mg .It amazing to know that 1 time donated blood can save 3 lives . The benefits of blood donation , also after the age of 40 the blood becomes thick automatically if we donate our blood regularly or in a specified time period the blood never becomes thick it will flow normally. The principal of Jimp Pioneer School Mr. Jagdish Pandey in his address to the students said that it is the duty of everyone to give back to the society in whatever capacity one can. The Principal also asked the students to take back the message home and spread awareness about the importance of donating blood.